Модификация Mercedes-AMG C 43 Coupe получила 3.0-литровый бензиновый твин-турбо V6 двигатель, который также встречается у седана Mercedes-Benz C450 AMG 4MATIC. При этом двухдверка получилась чуть быстрее четырёхдверного автомобиля в соревновании на разгон до первой «сотни». Мощность силового агрегата новой AMG-модификации купе C-класса составляет 367 л.с., а максимальный крутящий момент равен 520 Нм. Мотор работает вместе с девятиступенчатым «автоматом» G-TRONIC и системой полного привода 4MATIC, которая в стандартном режиме распределяет крутящий момент в соотношении 31 к 69 (в пользу задней оси). Разгон с 0 до 100 км/ч занимает 4.7 секунды против 4.9 секунд у седана Mercedes-Benz C450 AMG. Максимальная скорость у них ограничена электроникой на одинаково отметке – 250 км/ч. Система управления подвеской AMG Ride Control имеет три предустановленных режима: Comfort, Sport и Sport Plus. Кроме того у купе имеется четыре стандартные, а также одну изменяемая настройка работы силовой установки и трансмиссии. Модификация Mercedes-AMG C 43 Coupe отличается от стандартных купе оформлением бамперов, изменённой решёткой радиатора и салоном с кожаной отделкой и красной строчкой. По умолчанию устанавливаются 18-дюймовые колеса с шинами размерности 225/45 спереди и 245/40 – сзади. За доплату будут предлагаться 19-дюймовые диски. Affalterbach. Mercedes-AMG has added another sporty model to its C-Class family: the new C 43 4MATIC Coupé. For the highly dynamic driving experience that is the hallmark of the brand the Affalterbach-based development teams have put together a scintillating engineering package: the 270 kW (367 hp) 3.0-litre V6 twin-turbo engine is combined with the new 9G-TRONIC automatic transmission that provides agile gearshifts. Together with the AMG Performance 4MATIC all-wheel drive and the model-specific chassis technology, this provides the optimum basis for high agility and exhilarating lateral dynamics. Thus the new C 43 4MATIC Coupé also fulfils the brand promise of 'Driving Performance' in every respect. Dynamic growth characterises the corporate philosophy of Mercedes-AMG. A key component is the continual extension of the product range to include all-new models, which were hitherto not part of the portfolio. "The extension of the C-Class family to include the new C 43 4MATIC Coupé is another component in our growth strategy. It not only enriches the wide line-up of the C-Class family, but also starts the introduction of a whole series of new ‘43’ models this year", says Mercedes?AMG GmbH chairman Tobias Moers. "The ‘43’ models boast the characteristic AMG genes, which are also included in our GT and ‘63’ vehicles, and thus consistently interpret our brand essence of 'Driving Performance' in their segment". Sports car technology and motor racing flair thus become more attainable and appeal to a broader customer base. The 3.0-litre V6 twin-turbo engine provides impressive performance with its 270 kW (367 hp) maximum power and peak torque of 520 newton metres: sprinting from rest to 100 km/h in 4.7 seconds, its speed is electronically limited at 250 km/h. The newly developed front axle, the taut elastokinematics and the highly precise steering make a substantial contribution to the agile driving experience. The new 3.0-litre V6 twin-turbo engine is part of the BlueDIRECT engine family from Mercedes-Benz. Technical advances including a modified boost pressure allowed the AMG engineers to increase the engine's power output and torque as well as its dynamism and flexibility to typical AMG levels. With 270 kW (367 hp) and 520 Nm, the V6 engine sets new standards in its segment. The NANOSLIDE® coating of the cylinder liners is also used in the Formula One engines of MERCEDES-AMG PETRONAS. Especially tough and, therefore, wear-resistant, this coating also reduces friction, thereby contributing to higher efficiency. The AMG powerplant can be identified by the red aluminium insert in the engine cover. The 9G-TRONIC automatic transmission is especially matched to the demands of the Mercedes-AMG C 43 4MATIC. Thanks to the model-specific software application, the AMG developers managed to reduce substantially the shift times of the 9-speed transmission. The multiple downshift allows even faster short bursts of speed, while the double-declutching function in the "Sport" and "Sport Plus" transmission modes makes for an even more emotive driving experience. Defined ignition adjustments also provide faster gearshifts in the "Eco" and "Comfort" modes. "Manual" mode can be enabled by pressing a button on the centre console. The gear changes are based on the selected transmission mode, and the driver can now change gear using the paddles on the steering wheel. Moreover, the transmission stays in the selected gear and does not automatically shift up when the engine speed reaches the limit. The Mercedes-AMG C 43 4MATIC Coupé offers the optimum conditions for high driving dynamics and outstanding comfort on long journeys thanks to the standard-fit AMG RIDE CONTROL sports suspension. The four-link front axle is fitted with special steering knuckles and load-bearing joints; all components have been optimised in terms of rigidity. C 43 4MATIC Coupé to individual preferences at the tap of a finger. The available range extends from efficient and comfortable to very sporty. This modifies key parameters, such as the response of the engine, transmission, suspension set-up and steering. 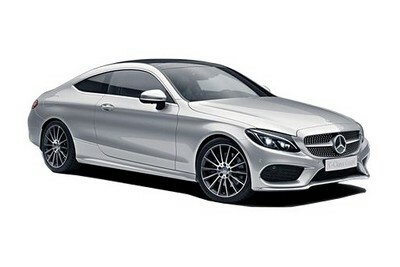 C 43 4MATIC Coupé with its variable ratio. It stands out with its precise, highly authentic feedback. The servo assistance can be varied in the "Comfort" or "Sport" setting. The relevant characteristics are automatically activated depending on the selected DYNAMIC SELECT transmission mode or can be personalised in "Individual" mode. The Mercedes-AMG C 43 4MATIC Coupé is likewise sporty in appearance, making it instantly recognisable as a member of the AMG family. Characteristic features include the distinctive AMG styling as well as the specific light-alloy wheels. They underscore the brand's progressive nature and performance. The engine cover with red aluminium insert accentuates the strengths of the new twin-turbo six-cylinder engine. The AMG styling includes the front apron with sporty distinctive air intakes, diamond meshes, silver chrome trim, as well as the rear apron with matt iridium silver diffuser insert. The diamond radiator grille features chrome-plated pins, a louvre in high-gloss black and the AMG lettering. Down below, the silver chrome front splitter ensures an optimal flow of air to the cooling modules. Additional highlights include the black exterior mirror housings, the high-gloss black waistline trim strip and window frame, as well as the two chrome-plated tailpipes with centre divider. Further striking features come courtesy of the new "BITURBO – 4MATIC" lettering on the front wings and the "AMG" (left) and "C 43" (right) lettering on the boot lid. Customers can choose the complementary optional Night package, which adds heat-insulating dark tinted glass rearward of the B-pillar, high-gloss black front apron trim, a high-gloss black diffuser-look insert at the rear, and two black tailpipes with centre divider. AMG 5-spoke light-alloy wheels painted in high-gloss black with a high-sheen finish round off the design visually. Size 225/45 R 18 tyres on 7.5 x 18 light-alloy wheels are fitted at the front, while the rear axle comes with 245/40 R 18 tyres on 8.5 x 18 wheels. 48.3 cm (19") light-alloy wheels in various designs are optionally available for even greater individualisation. The interior reinforces the consistently dynamic bias with numerous specially designed details. Ideal for a committed driving style, the multifunction sports steering wheel in black leather features a flattened bottom section and red contrasting topstitching, and sits perfectly in the hand. The driver finds a secure position in the sports seat even driving at speed thanks to the improved lateral support. The ARTICO man-made leather / DINAMICA microfibre upholstery and the instrument panel trimmed with ARTICO create a very sporty ambience. The man-made leather is also used on the upper edges of the body, the armrests, the door centre panels and the centre console. Red contrasting topstitching, designo red safety belts and black floor mats with red edging add attractive highlights. The aluminium trim pieces with light-tone longitudinal grain embedded in the instrument panel and the doors provide effective contrasts. The AMG instrument cluster delivers all relevant information in a clearly arranged layout optimised for a dynamic driving style. An authentic sports car look and feel is provided by two tube-shaped round dials, 11.4 cm (4.5-inch) multifunction colour display, RACETIMER and 280 km/h scale in chequered-flag design.